Here is a brief introduction to the course and the instructor. In this lesson, we talk about the zero product rule and review the process of factoring. We go through examples where we: 1. factor out the common factor 2. use identities such as difference of squares, difference and sum of cubes, perfect squares 3. use grouping 4. convert the given equation into quadratic form. In this lesson, we learn about solving radical equations. We also cover situations where we need to check for extraneous solutions. In this lesson, we learn how to define and evaluate expressions with integer and rational exponents. We also solve some equations. In this lesson, we discuss properties of exponents and radicals and apply these properties to the task of simplifying algebraic expressions. In this lesson, we look at problems which can be modelled with systems of inequalities in two variables. We learn to write the inequalities, sketch their graphs and interpret the solution to the system. In this lesson, we look at linear systems in three variables and we solve these systems using substitution and/or elimination. We also talk about the geometric interpretation of these solutions. In this lesson, we introduce basic vocabulary regarding polynomials, such as degree, coefficient, leading term, and we also perform addition, subtraction, multiplication and division on polynomials. In this lesson, we examine the method of finite differences to find the expression for a polynomial. We also verify the method of finite differences for a linear, quadratic and cubic polynomial. In this lesson, we use polynomial identities to solve equations in complex numbers. 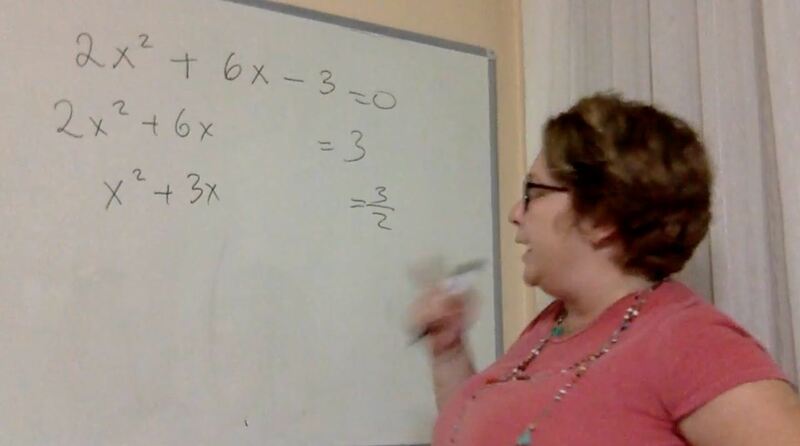 In this lesson, we add and subtract rational expressions where we expand the rational expressions using a least common denominator. In this lesson, we multiply or divide rational expressions and simplify the result through factoring and simplifying common factors between the numerator and the denominator. We also work with compound fractions, fractions where, in the numerator and/or the denominator, we have a sum or a difference of rational expressions. In this lesson, we revisit the quadratic equation and use completing the square to solve the equation. Then, we use the quadratic formula to solve some quadratic equations and we learn to use the discriminant to identify the nature of the roots. In this lesson, we look at the main features of a parabola, such as its direction, its line of symmetry, vertex and intercepts. We also sketch the graphs of parabolas using these features. In this lesson, we are working on solving systems of linear and quadratic equations. We are also graphing the systems and interpreting the solutions geometrically. This midterm exam covers lesson 1 through 15. The duration is 80 minutes. In this lesson, we learn about the definition of a logarithm and how to evaluate a logarithmic value. We also talk about the common logarithm and the natural logarithm. In this lesson, we explore the properties of logarithms, including the Change of Base Formula, and we evaluate and simplify logarithmic expression with these properties. In this lesson, we apply the properties of logarithms in solving logarithmic equations. We also learn to identify extraneous solutions to these equations. In this lesson, we will solve exponential equations. We will express some of the solutions as logarithmic expressions and use factoring techniques in some of the equations. In this lesson, we take a brief look at when polynomial, linear, trigonometric and exponential models are useful for certain real-life situations. In the second half of the lesson, we derive exponential models for given problems. In this lesson, we are introducing functions, function notation, domain, range and building functions. In this lesson, we look at operations on functions and transformations of functions. In this lesson, we first decide if a given function is odd, even or neither. We also look at the symmetry of odd and even function graphs. Then, we learn to take the inverse of a given function and to graph the inverse function on the coordinate plane. In this lesson, we learn to calculate average rates of change for functions over different intervals. Then, we learn to find linear functions whose rate of change is constant over any interval. In this lesson, we look at characteristics of quadratic functions, such as vertex and the axis of symmetry of a parabola. We find the vertex of a parabola using the intercepts, the quadratic formula and the method of completing the square. Then, we compare properties of linear and quadratic functions. In this lesson, we study exponential functions and their graphs. We look at important features such as intercepts, end behavior, asymptotes. We also cover transformations of exponential functions and go over finding the equations for exponential functions. This lesson has four objectives: 1. Applying the idea of a function to trigonometric functions 2. Revisiting the unit circle to sketch the parent sine and cosine curves. 3. Establishing features of trigonometric curves such as period and amplitude. 4. Applying transformations towards sketching graphs of sine and cosine curves. In this lesson, we look at logarithmic functions and graphs. We define logarithmic functions as the inverse of exponential functions, we identify features of their graphs and cover transformations of parent logarithmic graphs. In this lesson, we look at probabilities of simple events and we go over definitions of event, sample space, outcome and complement. We then represent situations with Venn diagrams and calculate probabilities from Venn diagrams. In this lesson, we work with the probability rules and learn to display information using tree diagrams. We also calculate conditional probability and learn about independent and mutually exclusive events. This midterm exam covers lesson 16 through 30. The duration is 80 minutes. In this lesson, we learn to calculate the measures of center and spread of distributions. We then interpret the shape of a distribution from its histogram. In this lesson, we cover the normal distribution and the standard normal distribution. We calculate probabilities from data values and data values from probabilities. We also find the mean and the standard deviation from given information about percentiles. In this lesson, we look at three issues in Statistics. We learn about the three types of statistical studies. we look at how we can estimate a population characteristic from a sample and we examine the sampling variability in considering the sample mean as an estimate of the population mean. In this lesson, we cover finding square roots of positive rational numbers and learn to apply proportional reasoning to problems. In this lesson, we look at properties of angles in triangles, polygons and on parallel lines. In this lesson, we apply theorems about angles and segment lengths related to circles. In this lesson, we talk about defining angles and trigonometric ratios of angles in the coordinate plane. Then, we introduce the unit circle and learn to use the unit circle to find trigonometric values. In this lesson, we look at how we can model a periodic trend with a trigonometric function. We apply the concepts of amplitude, period, phase shift and vertical translation in devising such models. In this lesson, we work with trigonometric identities to prove other trigonometric identities and simplify trigonometric expressions. This exam covers the entire course. The duration is 120 minutes. Good luck! This course is a gateway to Precalculus and it provides you with all the knowledge and skills you need in Precalculus. Over 15 hours of video-lessons! This video-course is primarily intended for 11th grade students who would like to solidify their mathematical skills and knowledge before they take Precalculus. Students taking this course will need to have completed Algebra I, Math for 10th Grade or an equivalent Math course prior to enrolling in this course.